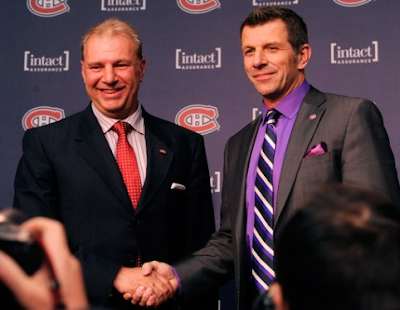 New era in Montreal or more of the same? How the Montreal Canadiens fare this season depends on a lot more than just staying healthy. It really depends on whether changes to the lineup, both now and in the near future by Marc Bergevin will allow Michel Therrien’s Habs to impose his system on the road. Now, before looking at the abbreviated 2012-13 Canadiens season, it's important to look back and understand exactly what areas of improvement the Habs actually require and compare the changes made since, to see which direction they're likely headed. From Windtalker; meaning the positive or negative total of head-to-head scoring in 5v5+4v4+3v3 play, excluding empty net and penalty shot goals. The primary benefit of ESD over simplistic 5v5 ratio is that it can be broken down further, to examine how teams perform at home vs. on the road to identify areas of strength or weakness. The same method can also be applied to special teams to look at Power Play Differential. Gone are the days of special teams being the difference with power play opportunities now at their lowest level in decades and by extension, power play goals. Case in point, there were 1,137 fewer power play goals scored last season compared to 2005-06, an average decline of 38 goals per team, even though the 17.3% average success rate in 2011-12 was only 0.4% less than in 2005. As a result, 78.5% of the goals scored last season didn't come on the power play. This is also a decades long high and the reason is simple when you consider teams now average a measly 3.31 power play opportunities per game. So, to win NHL games today, it's critical that teams with playoff aspirations have a robust even strength scoring differential, especially on the road. Teams built to impose their system on the road and execute against teams with last change have an overwhelming tendency to win at home as well while the opposite cannot be said. An example of this would be 13 of the 16 teams (81.2%) with the highest even strength scoring differential on the road (ESD-R) last year made the playoffs. And of the 3 teams (Chicago & San Jose & Florida) that made it without a Top 8 ESD-R in their conference? All 3 lost in the first round of the playoffs. Looking at the Canadiens over the past 14 years, their ESD-R has been simply horrific. So horrific in fact, it goes a long way towards explaining why the Habs missed the playoffs 6 times and finished seventh or eighth another 6 times. They managed to finish sixth in 2010-11 and in 2007-08 they finished first, bracketed once again by eighth and tenth place results. Over those 14 years, the Montreal Canadiens finished the regular season with a positive ESD-R just 3 times, the last time being 2005-06 when the Habs were +1. And for 9 of those years, the Habs ESD-R were double-digit negatives. The last time the Montreal Canadiens were retooled was in in 2009-10 when more than half the roster was changed to execute Jacques Martin's puck-possession system, starting with Scott Gomez who was acquired a month after he was hired. Yet again, the Habs were built to play well at home and keep teams honest with potent special teams. Problem was, the game had already changed. The chart clearly demonstrates that today, teams that win the even strength battle on the road also do well at home. And the best of them tend to get home ice advantage. ESD-R also help special teams though listening to various pundits on the Habs talk about the importance of special teams and PP% in particular, you'd think the opposite was true. It clearly isn't. Kudos to the work done by Springing Malik to track the impact of injuries last year. Using his numbers and colour coding them within a 10% variance of the league averages in 2011-12, it becomes easy to see if there was a correlation between performance and health. More importantly, it helps to identify teams that performed well in spite of their injuries and those that didn't. In either case, the quality of a team's NHL-ready depth was revealed, or concealed by the amount of quality man-games lost. Looking at the chart, it becomes clear the Eastern teams were beaten up a lot worse than the West last season. The Montreal Canadiens had the 2nd most man-games lost and the most cap space affected by injuries. Every team has injuries and last season the Habs were pummeled with 437 man-games lost, far above the NHL average of 277. One look at the Eastern conference rankings the past 4 years and your eyes should drift towards 2 areas; Hits and Giveaways. Not exactly the results you want to see from a team that claimed to be geared towards puck possession, which usually requires the ability to not only keep control of the puck but the ability to take it away. Successful implementation of a system requires the assets to impose will on the opposition, particularly on the road. Michel Therrien would like his team to play "on their toes" more, which means a more aggressive stance based on a stronger forecheck. The question is, will a few new bodies and an alter sacrifice for a relatively healthy lineup be enough? One benefit of being able to actually play "on your toes", as Therrien would say, is that it forces the opposition to make mistakes and take more penalties. When it comes to passive, counter striking teams the tell isn't how many power play minutes you get on the road but how many penalties you take trying to stop teams that are matching lines with last change. Lack of discipline is most often the result of getting beat so if you look at how many surplus power-play minutes (PP mins - PK mins) the Habs had on the road since the last major roster retooling 3 years ago, seeing them ranked 30th, 30th and 28th this past season with deeply negative power play minutes makes it obvious they haven't been imposing anything on anyone. Max Pacioretty - 41 (70) points. Seventy point players are rare birds in Montreal but Pacioretty has a chance to reach that plateau. He bulked up yet again this off-season and uses his wrist shot more than anyone in the NHL so expect Pacioretty to lead the Habs in scoring again this season. Tomas Plekanec - 35 (60) points. Still managed 52 points with screen doors for wings last year while logging the hard minutes. The responsibilities won't change but stability on the line with a healthy Gionta and a raw rookie in Galchenyuk will be better than what he had to put up with last year. Erik Cole - 32 (55) points. Thirty-four year olds who matched a career high with an uncharacteristically high shooting percentage aren't prone to repeat, let alone top them. Expect a small drop off in goals but his physically play and leadership will help create time and space for Desharnais and Pacioretty. David Desharnais - 32 (55) points. Cherry minutes. All year. That basically describes the season Desharnais had. Problems for the Habs number 1 line came on the road last year, when teams with last change got the match-ups they wanted. The result was a 35% drop in point production for the line away from the Bell Centre. Brian Gionta - 26 (45) points. Last year was a forgettable one for Gionta who had his season ended in January with bicep surgery. When healthy, he's as good on the road as he is on home ice but he's 34 now and a UFA after next season so his time is winding down in Montreal. Alex Galchenyuk - 23 (40) points. Welcome to the deep end of the pool Alex. The Plekanec line plays against the top offensive unit so mistakes will wind up in the net. IF he plays well enough to stay in Montreal, he'll break into the NHL as the designated puck hound and corner man for Plekanec and Gionta playing LW, the position he had before arriving in Sarnia where he was moved to center for one season. Should Galchenyuk be sent back to Sarnia, Rene Bourque is the top candidate to rejoin the Plekanec line. Galchenyuk only played 8 games his second year and was moved back to LW this season, not just in Sarnia but the US World Jr. team as well. With little experience in the faceoff circle compared to his opponents, look for Galchenyuk to practice draws at every opportunity. How much he works on it will be an indicator where the Habs plan to use him down the road. Lars Eller - 20 (35) points. Eller is primed to take a big step forward this season after proving his worth against tougher opponents last year. Defensively responsible and tough on the boards, Eller's ability to dangle with the puck has been his greatest improvement. Rene Bourque - 18 (30) points. A quarter of Bourque's goal production typically comes off deflections, not shots. To do that he needs to be in front of the net, not chasing pucks. Eller and Moen will help in that regard but Bourque won't the ice time or power play minutes to come anywhere near the numbers he put up in Calgary if Galchenyuk stays in Montreal. Regardless, Bourque is a prime candidate to be bought out this summer. Travis Moen - 12 (20) points. The Habs top penalty killing winger is the kind of foot-soldier the Habs need more of. Hard to play against with the mobility to play on the 2nd line in a pinch, Moen finally got some physical support this summer. Brandon Prust - 12 (20) points. Prust is the kind of player Moen was during his time in Anaheim. Defensively responsible, capable of contributing offense and a true middle weight scrapper. Prust can also play Center and has the mobility, like Moen to play on a higher line in a pinch. Colby Armstrong - 9 (15) points. Armdog is more dirty than tough but he's a solid veteran influence who's a one-year stop-gap. His style of game is also the reason why he now struggles to stay healthy. Ryan White - 9 (15) points. Tough as nails and fearless, White is a Jack Russell terrier who'll do anything for his teammates and is respected for it. A natural Center, White has typically been used at RW in Montreal where they need his tenacity on the boards. Like Armstrong, his style of play has made it difficult to stay healthy. Depth: Brendan Gallagher, Louis Leblanc, Petteri Nokelainen, Mike Blunden, Aaron Palushaj, Gabriel Dumont. Not much veteran depth and a lot of kids with little or no NHL experience. If any of Montreal's top 3 Centers get hurt, there's no help coming. P.K Subban - 26 (45) points. With just 181 games of NHL experience, Subban has already proven he can play in all situations and was top 20 in average minutes played by defensemen last year. Given his age and tough match-ups, Subban was a very respectable +9 on a 28th placed team. This season, Subban has a chance to crack the equivalent of the 45 point plateau; 26 in 48 GP but that may be hindered by how long he holds out in contract negotiations. With Hal Gill not sufficiently replaced, the D is far too thin to withstand a lengthy absence. Andrei Markov - 23 (40) points. Few sentences to describe Markov don't start without an "If" and anyone who isn't quietly concerned about the 34 year old's ability to stay healthy isn't being honest. The Habs need him to stay healthy and that's with Subban in the lineup. Markov still has a great outlet pass but has lost some lateral and backwards mobility. Playing 21 games in the KHL was hopefully enough time to adjust his game accordingly. Markov is excellent at passes in the O zone for one-timers and hopefully will still be able to sneak in from the point for back-door passes at the net. Tomas Kaberle - 20 (35) points. Kaberle worked hard this off-season and got in some games, along with Plekanec in the Czech Republic during the lockout. Still, Kaberle is now little more than a power play specialist in a league with fewer power plays. A soft, defensive liability at even strength, he'll get protected minutes. Raphael Diaz - 12 (20) points. Plays a positional game and only slightly more physical than Kaberle. Has offensive skills and is a quality passer but can be dominated in his own zone. Josh Gorges - 9 (15) points. Carey Price will be buying Curious Gorges a lot of steak dinners this year. The NHL's runaway leader in blocked shots lost his penalty kill partner, Hal Gill, the 16th ranked shot blocker last year. Gorges will get flak, as he always does, for a few goals that deflect in off of him from fans and media but for the 250 or so shots at Price that he doesn't need to save, it's well worth it. Alexei Emelin - 6 (10) points. In 67 games, Emelin was 4th in the NHL in Hits. A healthy Markov will provide the guidance and outlet passes to reduce the number of times Emelin gets pinned in his own zone this year. Look for Emelin to get more responsibility clearing rebounds and bodies in front of Price. Francis Bouillon - 6 (10) points. Hard to believe "Soup" is now 37 years old. At this point of his career, he's a one year stop-gap that'll provide some veteran leadership who'll play physical. Depth: Yannick Weber and Frederic St. Denis. Onion paper thin is the only way to describe it and Weber is trade bait. The Habs need to do what they can to leave kids like Tinordi in Hamilton for the rest of the year. If any of Subban, Gorges, Markov or Emelin are hurt for any length of time, team doctors will be writing Carey Price scripts for Xanax. Carey Price - 22 (37) Wins, .918 SA%, 2.40 GAA. There should be little doubt that Price is going to face a lot more rubber this year and as his season goes, so will the Habs. The Habs forwards should do a better job forcing teams to shoot from further out so it'll come down to how well the Habs defense can clear bodies and rebounds in front of Price. For a unit that isn't big or physical, limiting second chances will be difficult but essential. Peter Budaj -Short of an injury to Price, Budaj will be hard-pressed to see 8 games. In a shortened season where the magnitude of winning/losing streaks and injuries are nearly doubled, there will surely be some tie-breakers required to settle the last playoff spots. When teams are comfortable in the knowledge that a relatively healthy year is anything less than 277 man-games lost and injury free is defined as anything less than 200, NHL-caliber depth will be more important than it already is. Because the Habs depth is razor thin, especially on the back end, it's very likely that they will miss the playoffs in consecutive years for the 1st time since 1998-99 to 2000-01. To make the playoffs, the Montreal Canadiens will need a full year from Markov, a quickly signed Subban and a talisman of health to squeeze in.